What Parts of the Body Does Bursitis Affect? What Are the Symptoms of Bursitis? How Can I Prevent Bursitis? Bursitis is the inflammation or irritation of the bursa. The bursa is a sac filled with lubricating fluid, located between tissues such as bone, muscle, tendons, and skin, that decreases rubbing, friction, and irritation. Bursitis is most often caused by repetitive, minor impact on the area, or from a sudden, more serious injury. Age also plays a role. As tendons age they are able to tolerate stress less, are less elastic, and are easier to tear. Overuse or injury to the joint at work or play can also increase a person's risk of bursitis. Examples of high-risk activities include gardening, raking, carpentry, shoveling, painting, scrubbing, tennis, golf, skiing, throwing, and pitching. Incorrect posture at work or home and poor stretching or conditioning before exercise can also lead to bursitis. An abnormal or poorly placed bone or joint (such as length differences in your legs or arthritis in a joint) can put added stress on a bursa sac, causing bursitis. Stress or inflammation from other conditions, such as rheumatoid arthritis, gout, psoriatic arthritis, thyroid disorders, or unusual medication reactions may also increase a person's risk. In addition, an infection can occasionally lead to inflammation of a bursa. Bursitis is more common in adults, especially in those over 40 years of age. The most common symptom of bursitis is pain. The pain may build up gradually or be sudden and severe, especially if calcium deposits are present. 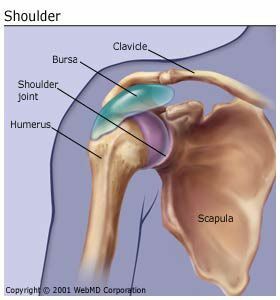 Severe loss of motion in the shoulder -- called "adhesive capsulitis" or frozen shoulder -- can also result from the immobility and pain associated with shoulder bursitis. If you are planning to start exercising, you will be less likely to get bursitis if you gradually build up force and repetitions. Stop what you are doing if unusual pain occurs. If the condition does not improve in a week, see your doctor. Your doctor can also prescribe drugs to reduce the inflammation. Corticosteroids, also known simply as "steroids," are often used because they work quickly to decrease the inflammation and pain. Steroids can be injected directly at the site of injury. Injections are often, but not always, effective and can be repeated . However, multiple injections in a several month period are usually avoided due to potential side effects from the injections and the possibility of masking problems that need to be treated differently. Physical therapy is another treatment option that is often used. This includes range-of-motion exercises and splinting (thumb, forearm, or bands). Surgery, although rarely needed, may be an option when bursitis does not respond to the other treatment options. These could be signs of another problem that needs more immediate attention. What Is My Rotator Cuff? Slideshow: What Is Frozen Shoulder?